The relational nature of nursing is what is most precious to me and informs my work most deeply. Wherever we practice- as clinicians, educators, or administrators- the bonds we share with our fellow nurses are strong and indissoluble. I call it the nurse-nurse bond. The compassion we show for each other can and does carry us through the most unimaginable experiences everyday, everywhere. When asked about the source from which my work in compassion emerges, I always respond that it is the love and caring of my nurse colleagues. I have been so very blessed to have compassionate helpers in my journey. From the outstanding faculty at the University of California San Francisco School of Nursing in the 1970’s to the superb researchers in my PhD program at the University of Washington School of Nursing, I have been shown the difference that compassion makes. 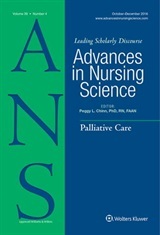 Looking back at my scholarly work during the past decade, I owe so very much to my students at the Hahn School of Nursing and Health Science at the University of San Diego. I couldn’t have done this work without your wisdom, encouragement, and vision. You have taught me what compassion really looks like. It looks like nurses who work for 12 long hours in unimaginable environments, then come to class eager to learn about strategies to improve health care. It looks like nurses from diverse backgrounds that work hard to forge bonds of community in a classroom. It looks like nurses who read Advances in Nursing Science deeply and discuss it passionately. In short, compassion looks like YOU. The networks of that we develop in our communities are significant, and influence the ongoing development of nursing knowledge. This blog provides an avenue for all ANS readers to participate in this community. W welcome your comments, questions and perspectives!